The details of this photo was written on the back. Miss McBride also showed it to me before her retirement. If you have information about these children please contact us. You will never believe this but my sister is in this photo, Eileen Davidson. She thinks she knows about 4 people and she is almost as excited as I was when I spotted my photo. Start of second row she thinks is Mary (someone) and maybe next to her is Heather who used to sing the 40 shades of green as her party piece. The tall boy in the middle of the back row I am almost sure is Jim Getty. 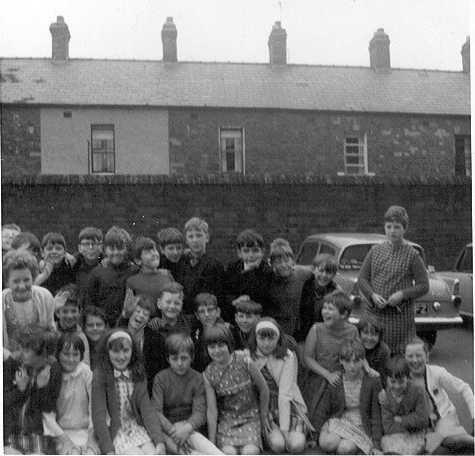 The boy in the middle laughing and holding his hand up i think is Ken Harvey and the boy to the right behind Brenda Shaw is Colin Jordan. We all went on to Orangefield, I think Jim Getty went into banking Colin joined the fire service. Hi, this is Edward Wilson, and I am in this picture, second row, second from left and waving. I can name some of the boys, but none of the girls (it was a P7 class). In the back row and 4th from the left is Paul Jordan(wearing glasses), next to him is Brian Cochrane. The 7th from the left is Stanley Richardson (?) who is famous for swallowing his dinner money while playing football in the playground and having to be taken away in an ambulance. It was 2 shillings and sixpence, in change. He was in goal and had put it in his mouth to save a shot, he saved the money instead. Next to Stanley is Jim Getty. The second row boys start with myself then Alan Clark. 5th from the left is Colin Jordan and beside him Jim Cordner. I have dragged some of these names from very deep recesses, and will look at the site again to see if anyone else has completed the picture. Please continue your good work. Regards Edward Wilson.